The MediaGration MP3 Player is a revolution in media. MP3 Player for Virtuemart 3, is designed for music and audio download sites, recording artist, record labels, and it is designed for sites that sell physical media (CD), or EP download or on-demand music. It is 100% connected to Virtuemart. Play muted video or a video playlist in the background! The MP3 Player play o muted videos in the background while the audio track is playing - is unique! No other application does this - in any framework. 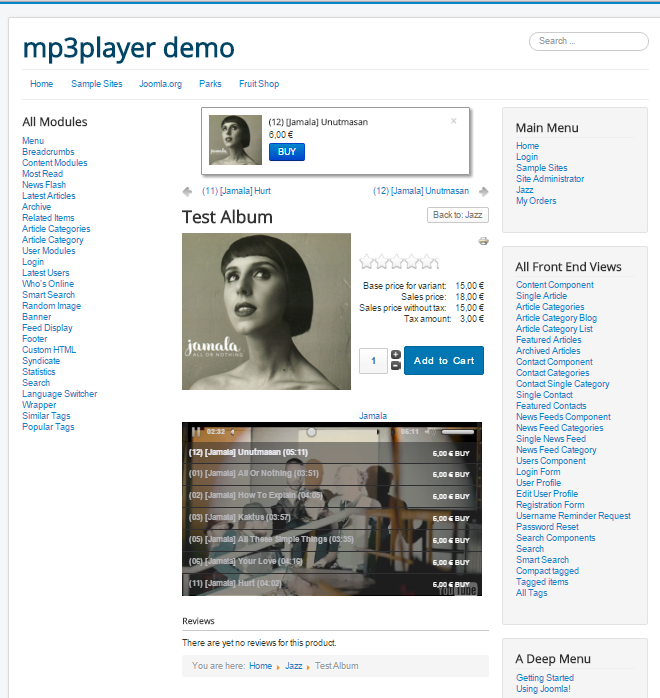 The basic user experience is to play the MP3 Player's playlist indefinitely, until the user decides to purchase a download or media product related to the track in play. Also sellable - the related music video!